The choice of groundcover plants used under grapevines may reduce the quantity of mealybugs found on grapevines in New Zealand vineyards. 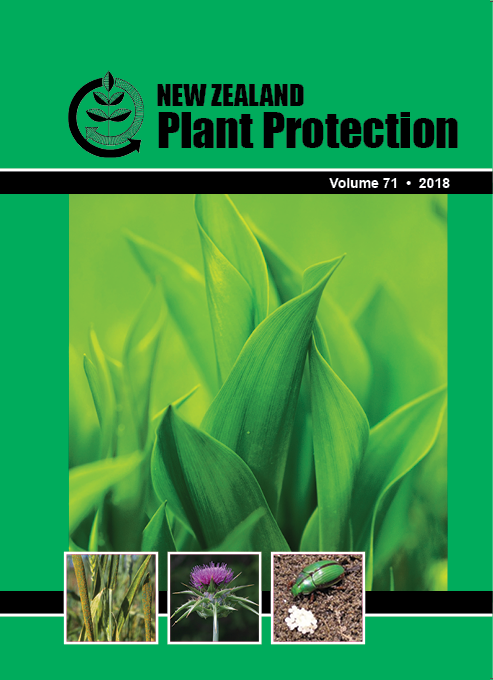 Preferences of Pseudococcus calceolariae and P. longispinus mealybugs on five clover cultivars were tested under ‘no-choice’ and ‘choice’ conditions. Two plants of each cultivar: ‘Karridale’(KS) (Trifolium subterraneum, L.), ‘Tripoli’ (TW), ‘Nomad’ (N) (T. repens), ‘Crimson cv’ (C) (T. incarnatum) and ‘Strawberry cv’ (S) (T. fragiferum) grown in pots, were arranged in randomised designs for the no-choice and choice tests and inoculated with newly emerged mealybugs. In the no-choice test, significantly more mealybugs (either species) were observed on KS and C than on TW, N, or S plants after 21 days. In the choice test, significantly more P. calceolariae were observed on KS than on TW, N, or S, while mealybug numbers on C were intermediate. Numbers of P. longispinus were significantly higher on KS and C than on TW, N or S. Mealybugs demonstrated preferences for KS and C over TW, N or S. These findings could aid development of recommendations for groundcover management in vineyards.